I’ve been described as stubborn and obstinate (when I’m being annoying) and determined and relentless (when I’m getting sh*t done). All are accurate descriptions of me, and these adjectives can sometimes mean that I get firmly entrenched in my way of doing things. So I think it’s a good idea to remind myself to stay open to different habits and approaches to life and health—from the what-the-F?! to the that-makes-sense. The Ultimate Healthy Living Bundle comes around each September to remind me that there are lots of people doing all kinds of interesting things in the realm of good health and happiness. And this year is no different! The whole bundle is just $29.97—and it’s on sale today through September 10. I’m pretty excited about my contribution: It’s our collector’s edition magazine of fast recipes called Well Fed 30-Minute Paleo Recipes. If you missed it when it was on newsstands and in the checkout lane of the grocery store, now’s a great chance to get your hands on it and a bunch of other helpful resources. But enough about me: Look at this vast array of stuff! This awesome online guide provides in-depth coverage of 12 national parks in the U.S., including an overview, photos, personal tips, hikes and their difficulties, activities/destinations/museums/visitors centers, links to maps of the park, and accommodations (hotels/camping), plus overview videos made by the author’s son and favorites from the kids (ages 11-16) themselves. There is also super-helpful info for road trips like packing, fun time in the car, dealing with very long rides, and why families need nature. I enjoy how personalized this guide is and that it includes many ideas for how to make the most of each (or any) destination. 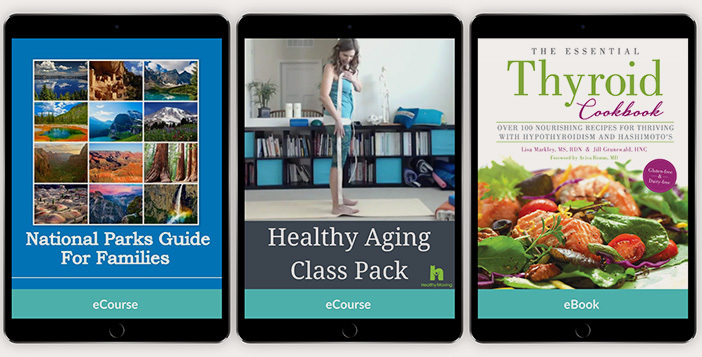 In this bundle that includes video and supporting information, Jen Hoffman—Certified Personal Trainer, Restorative Exercise Specialist, and Registered Yoga Teacher—guides you through movements that help re-align your body. The videos—a 1-hour class, a 30-minute standing flow, a 10-minute wall practice, and a 30 minute healthy hips floor class—address joint health in the neck, back, hips, knees, and feet. Jen also provides weekly emails with additional exercises and tips. These are good-quality videos with nice natural light and comprehensive instructions based on proper natural alignment— and Jen has a warm, welcoming personality. This is a wonderful book, and the authors—Lisa Markley (MS, RDN) and Jill Grunewald (HNC)—are genuinely caring, smart people.I’m honored to have contributed a few recipes to this collection—but the book goes beyond recipes. It’s like a handbook to educate you for a lifetime of peak thyroid function—no matter where you currently are on your wellness journey. In the Essential Thyroid Nutrition section of the book, Jill delivers real education so you’ll understand the root causes of Hashimoto’s and hypothyroidism, the key nutrients known to boost thyroid and immune function, the connection between digestive health and thyroid imbalances, and how to determine if certain foods may be triggering inflammation. This is not a paleo or Autoimmune Protocol (AIP) book. 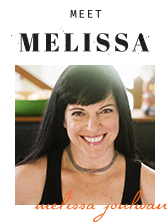 Instead, Lisa and Jill used a rigorous academic approach to identify the foods that are the most supportive to your thyroid and immune system. 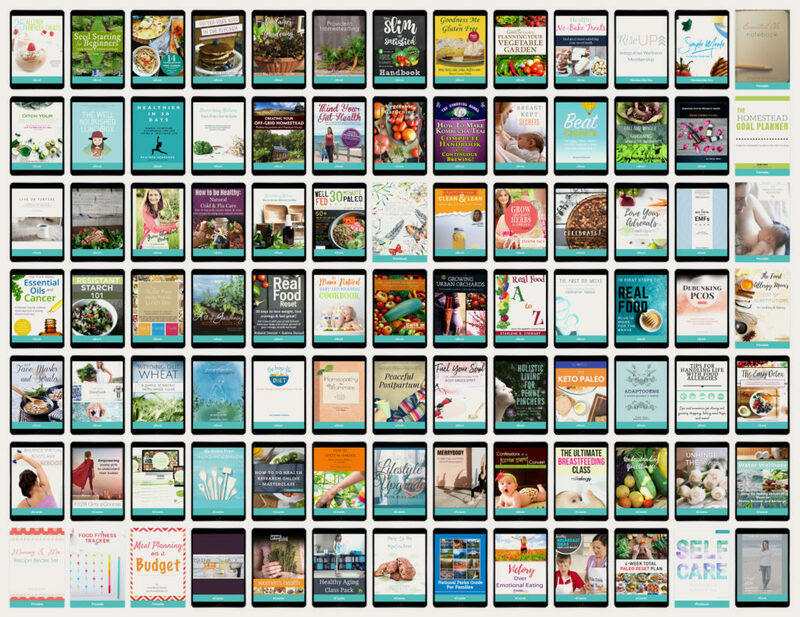 Then, from this research, they created a “nutritional springboard” to serve as a foundation for the recipes. The recipes are therapeutically designed to incorporate key foods and nutrients for thyroid and immune health, without sacrificing taste. 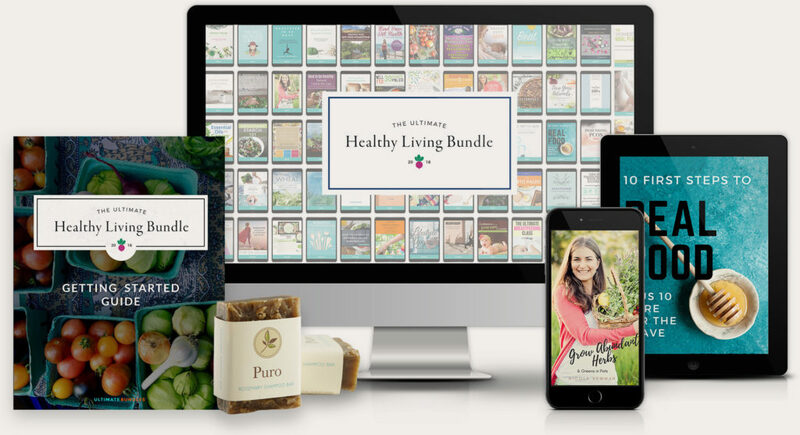 Get your copy of the Ultimate Healthy Living Bundle now! 1. Visit the official web site, take a quick look at all the goodness that comes in this bundle, then click the “Buy now!” button to go through the simple and secure checkout process. 2. You’ll receive an email with a login to the online access portal, where you’ll begin downloading your eBooks, signing up for your eCourses, and redeeming your free bonus offers. 3. Use the Getting Started Guide to pick the topic you want to tackle first and start exploring some of your new goodies! #1: The bundle is backed by a full money-back happiness guarantee, so you can make sure it’s right for you. If you don’t love it, just email customerservice@ultimatebundles.com to ask for a full refund. #2: The bundle goes away at 11:59 p.m. Eastern on Monday, September 10, so don’t wait. Buy your bundle now. The small type: In addition to being a contributor to The Ultimate Healthy Living Bundle, I’m also an affiliate which means I make a small commission when you buy a bundle. Thanks in advance for helping me keep doing this work!